Coated roller chains are best used in applications that require a high-strength economical corrosion resistant roller chain. We have single strand, double strand, triple strand, and double pitch roller chains, as well as attachments available from stock with a corrosion resistant coating. When comparing coated roller chains with standard roller chains that have both run in a medium corrosive environment (gate operator near the coastline), you can see from the above image that the standard chain started to show major signs of rust while the coated roller chain still looks practically new. We offer four separate quality levels when it comes to coated roller chain: Economy Plus, General Duty Plus, Premier Series, and Double Coated Premier Series. Economy Plus coated roller chain is good for light duty industrial applications. General Duty Plus quality roller chains are good for medium to heavy duty industrial applications. Premier series coated roller chains are manufactured for the extreme duty and toughest applications. They feature solid bushings and solid rollers for increased performance. They use the best quality components for maximum strength and durability. Double Coated Premier Series coated roller chains are designed with the same strengths and features as premier series chains but with double the coating. This means that in most corrosive applications, it will last twice as long as the standard premier series coated roller chains. We have coated roller chain attachments in-stock with inventory including standard coated attachment connecting links (outside link) and roller links (inside link). You can purchase coated roller chain attachments individually or we can supply the chain with attachments already on it. The information needed is the chain size, attachment type, and spacing. If the information is not available or you are having trouble identifying the attachment, contact our customer service department and we will be happy to assist you! Using a stainless steel sprocket with your coated roller chain is not necessary, but if it is going in a corrosive environment, we highly recommend it. At USA Roller Chain, we have an extensive inventory of high quality 304-grade stainless steel sprockets. 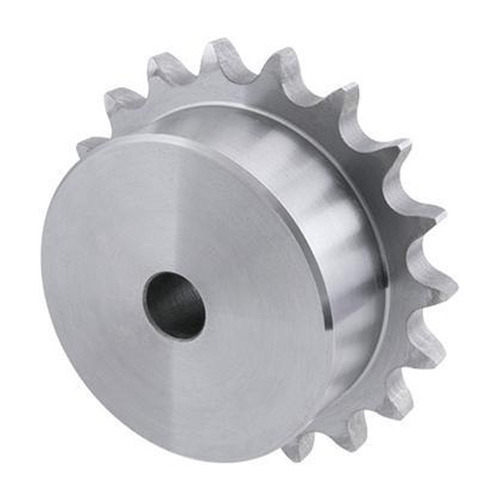 If you do decide to use a standard roller chain sprocket, we have those in stock as well with a black oxide coating for some corrosion resistance.